And because the gel is very thick, it minimizes leakage, even if the cushion is punctured. The Gel Powder is inside the cushion -Just add 16oz (or 2 Cups) Water. The black cover protects the cushion and a quick strap keeps the cushion in place. 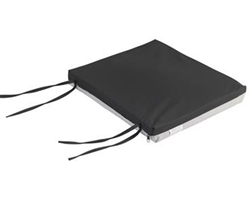 Included is a waterproof cover with nylon top, non-slip vinyl bottom, and carry handle. 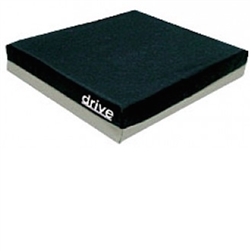 The Drive Gel-U-Seat Lite Cushion is designed to redistribute pressure and to help avoid pressure ulcers. This seat offers a 275 lbs. or 500 lbs. weight capacity, depending on the model chosen. Utilizes a positioning foam base for pelvis immersion, providing comfort and stability with its waterfall front edge and sacral cutout. A ThinAir bladder functions as a comfort layer while also assisting in redistribution of peak pressures away from a user's bony prominences. Waterfall front edge. Made with Ultra-FreshTM for antibacterial and odor protection. The ischial relief area of the Matrx PS Cushion features a waffled recess for immersion of bony prominences. 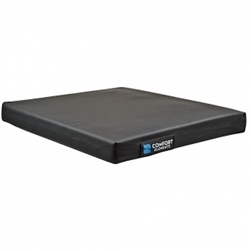 This hybrid cushion captures the stability of foam, the pressure redistribution of air and the shear management of fluid. A ThinAir bladder is designed for comfort, assisting in peak pressure redistribution away from bony prominences. The high quality, Ultra-Fresh foam base uses a pre-ischial contour and provides antibacterial and odor protection. A Platilon liner grants the cushion an additional layer of moisture protection. Gel Seat Cushions virtually eliminate uncomfortable pressure points and lets you sit hours longer in comfort.